I’m at a loss for words today! I’ve started writing five times and erased it each time. It’s not that I have nothing to say, I honestly think I never have nothing to say, even if the something isn’t actually worth saying, which is probably most of the time! I’ve been thinking a lot about how people say what they say, and why they say it, and thinking about this too much can make it feel foolish to say anything at all! I have a lot on my mind, but I guess it’s not ready to leave my busy head yet, so I’ll let it marinate for a while. In the meantime, I keep coming back to this scene. It is a sad and beautiful world! I love Benigni’s cheerfulness. I love Wait’s magpie crankiness. I love the fact that they understand each other despite the words. I love that they both love the words so much they repeat them in their own way. I love the honesty and humor of it. And the beauty, of course! It is a sad and beautiful world. I bought strawberries and then we picked strawberries, so we had a lot of strawberries. I wanted to make them into ice cream, but I don’t always like strawberry ice cream. Sometimes the strawberries lose their flavor when they’re too cold. Aha! I thought to myself, what if they have a protective coating of bittersweet chocolate to shield them from the cold! Because chocolate covered strawberries are delicious, and they could only be better if folded in vanilla ice cream. This turned out really good!! A nice balance of bitter and sweet, fruity and creamy. The boys loved it, and asked for many many helpings. The strawberries aren’t completely coated in chocolate, but they each had enough chocolate clinging to them to get nice and melty with the ice cream. Well, it was very tasty! Here’s Irma Thomas It’s Raining. Well, it’s also from Down By Law, and it’s beautiful. In a medium saucepan over medium-low heat, warm the milk and vanilla. In a medium-sized bowl whisk the eggs, sugar, cornstarch and salt until frothy. Whisking all the while, pour the milk into the eggs in a thin stream. Return the mixture to the medium-sized saucepan over low heat. Warm, stirring constantly, until it thickens enough to lightly coat the back of a spoon. Five or ten minutes, I think. Pour into a bowl, stirring constantly. Put the bowl in a pan of cold water, whisking all the while, to cool the mixture down. Cover and chill in the fridge 5 hours to overnight. Melt the chocolate in a saucepan over a saucepan full of lightly boiling water. (Be careful not to get even a drop of water into the chocolate or it will seize up.) Mix the strawberries in to the chocolate, using a spoon or your fingers (it will get messy!) They won’t be completely coated, but each piece of strawberry should have some chocolate attached. Line a large baking sheet with foil. Spread the chocolate mixture in an thin layer on the foil. Don’t worry about getting it neat or even, you’re just going to break it into pieces later. Chill in the fridge for about an hour, until it’s brittle. When it’s cool break it into pieces about 1/2 inch square. Eat them, or drop them into ice cream! 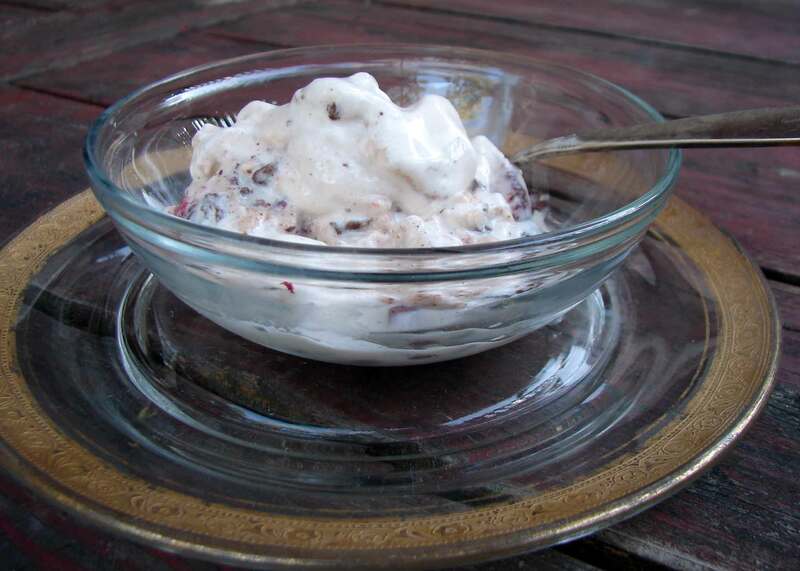 This entry was posted in chocolate, dessert, recipe and tagged chocolate covered strawberry pieces, chocolate strawberry ice cream, strawberry chocolate chip ice cream, vanilla ice cream by Claire. Bookmark the permalink.